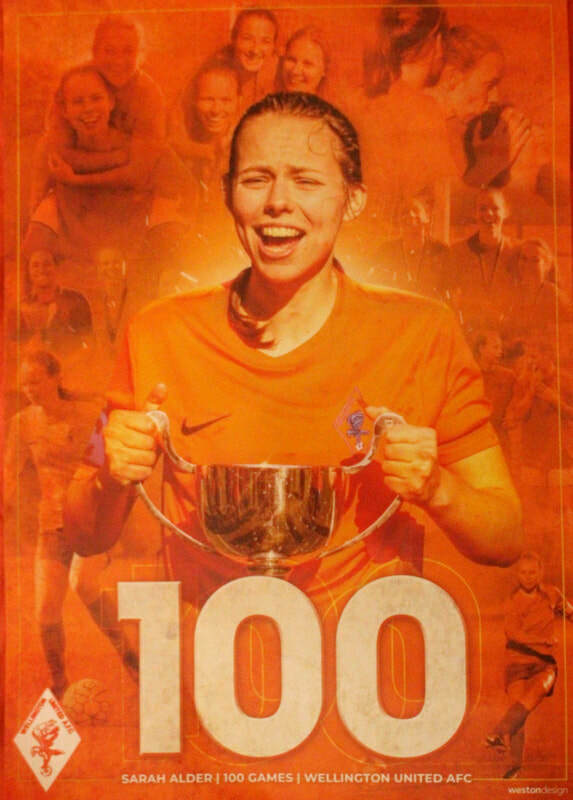 Wellington United Diamond's game against Petone in the Kelly Cup Bowl on Saturday saw Sarah Alder make her 100th appearance for the club in a comfortable 2-0 win. We have playing records for our family of clubs since 1968 and Sarah joins the likes of Jeff Strom, Malcolm Dunford, Billy Harris & John Barry and around 40 others who have made a century of appearances. Sarah is only the second women to achieve this feat, the other being current Women's club captain Sandy Cumpstone. Sarah started playing football when she was just 6 years old, when a friend asked if she would play in his team. She played in juniors at Waterside Karori and Onslow before joining Wellington United in 2012. Having several friends already at the club and knowing the coach, Guillermo Schiltenwolf helped make her decision, while the year on year progress and improvement and the general family vibe of the club has kept her here. Diamonds coach, Guille says "Seeing a player like Sarah reaching her 100th game for the club makes me absolutely happy and proud. She is one of the 6-7 players that trusted on us back in 2012, she is one of the main pillars of this team. She understand what a family is, what it does really means. What it means to be loyal to our family thank you Sarah for everything you have done and keep doing for the team-for another 100 games"
Sarah originally was a striker but in 2016 Guille moved her into the Left Back position and she set about making it her own. It was the season she says she really felt she came into her own in the team. It is also the season she cites as one of her main highlights as the Diamonds won the Women's Central League for the first time ever. Another highlight was last season's Kate Sheppard Cup quarter final win over Wairarapa United, which they won 3-1 after going down 1-0 and got the club into the semi-final, the furthest they had ever been in that competition. Unfortunately she was unable to play in the semi-final due to being in Kazakhstan representing NZ Universities in her other passion, Futsal. While many footballers also play Futsal, Sarah has excelled at both, particularly Futsal, being named Capital Football player of the year for Futsal in 2018 and also winning international honours with the MZ Universities and the Futsal Ferns. Sarah, who has scored 34 goals in her 100 appearances, embodies the team and family atmosphere of the club and is reluctant to single out individual's when asked who are the best she has played with, eventually naming Michaela Robertson, Francesca Grange and new arrival Emma Main among the best and Football Fern Sarah Gregorius as one of the toughest opponents she has faced in her 100 games.